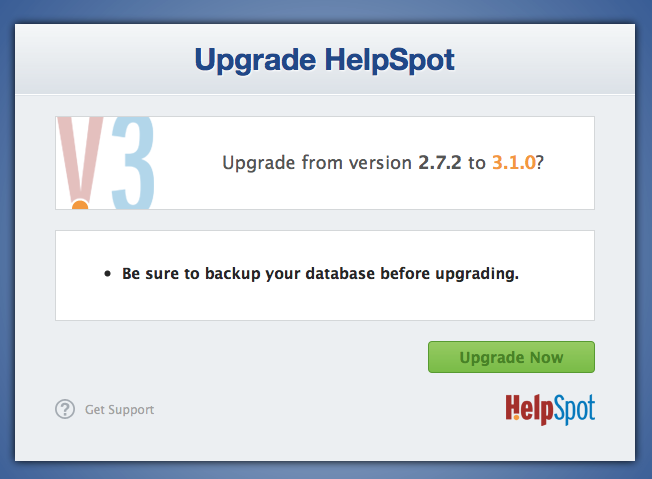 It's strongly recommended that you backup your HelpSpot database and files before upgrading. It's especially important to backup files if you have customized your templates or edited the language file. The installer will make database changes during an upgrade. If something goes wrong the only way to roll back the changes is if you have an up to date backup. Proceed directly to running the installer and follow the on screen instructions. All steps below will be completed for you automatically by the installer. The Windows installer may only be used to upgrade if it was used for the original installation. If your Live Lookup files are in the root HelpSpot folder they may be moved to a backup. You'll need to place them in /custom_code instead and update your LiveLookup path in setttings. If you've set your attachments to save to disk and put that path in the HelpSpot folder structure that will likely be broken. You should move the folder to someplace outside of the website and HelpSpot roots and change the setting in Admin->Settings->System. The upgrade process is more complex due to underlying improvements. Please see the Updating to HelpSpot 4 documentation for more information. The language pack format has changed for version 3. If you use a custom language pack you'll want to download and update your language pack before upgrading HelpSpot. After downloading the new version of HelpSpot, move the files to your server and unpack the tar.gz or zip file in a temporary location. Copy the new files over the old HelpSpot files, overwriting them. Note: The HelpSpot files are binary and your FTP program will most likely upload them as text unless you tell it to use binary mode. This is why it's recommended to move the compressed file (tar.gz/zip) directly to the server first which will avoid any problems. After uploading if you get a file corrupted or Fatal error in your browser at the installer then the files have been uploaded as text instead of binary. The upgrade is now complete. Take a few moments to go through your installation and confirm it is running correctly.